And lets not forget that the Revell 'L' version is 1/72 scale and the Matchbox is 1/76 so we are talking dolphin as opposed to porpoise? Hmmmm, we’re up to 17 enlistees now but it’s gotten pretty quiet around here. 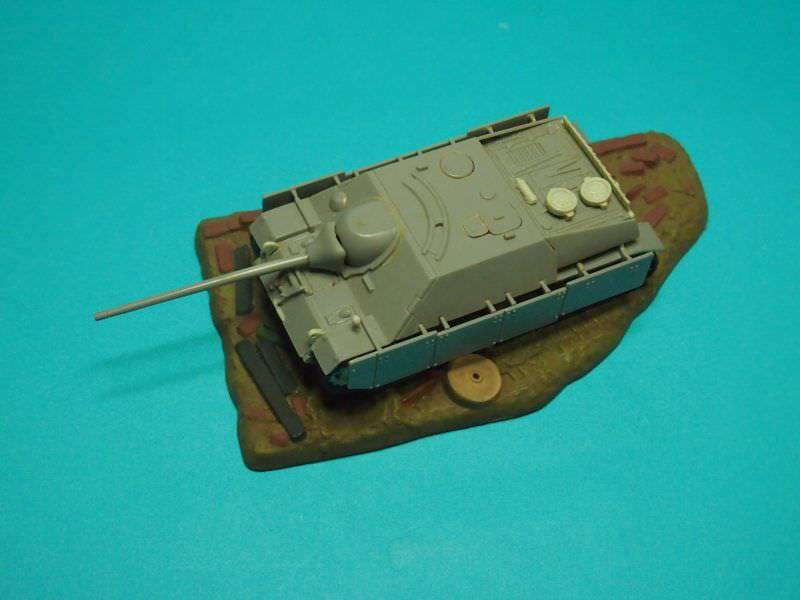 Been working on rehabilitating my Matchbox Panzer III lately and might have a picture or two in a day or so. Also looking through storage containers for other “historic” Matchbox items. For me, just lurking for now. I have my four picks for the campaign but it says it does not start until Jan '19. Didn't want to start now and get disqualified. Build one now and buy another for the start of the campaign! I am in the process of finishing my M16 for the anti-aircraft build and will post a pic or two here for interests sake. No no no… I don't want to do that. My procrastination will kick in even before the campaign starts and ruin it. I already still have a bunch of 'work in progress' from previous Kitmaker Campaigns I have not completed. I will get over my procrastination. You just wait and see. No no no… I don't want to do that. My procrastination will kick in even before the campaign starts and ruin it. Rob, really? Do you think we'd allow that to happen? I personally have ahem, "associates" in Roswell in your state and they could pay you a visit for encouragement purpose? Anyway, as promised a couple of images of the Panzer III with a start at revitalizing. Roadwheel black is from the original build while spares on the fenders are trying the newer Tamiya Rubber Black that doesn't look too bad compared to the "old" paint. Don't these get your creative juices flowing? Nice start to the refurb Jan.
Pete, this is, Armorama so therefore you should not be surprised that the...ahum..., gentlemen are Che, Fidel, Raul and Ernesto? My thanks while I build up the nerve to try to bore out the 1/76 gun barrel with a .0366" (.93 mm) drill? Hey gents, sorry for my conspicuous absence… I've been busy and spending the Little free time I had at the bench. Whoohoo! Now that's a trip down memory lane in several respects. I remember a neighbour boy having built this kit and I was fascinated by it. And not it's mine!! My own! My Precious! So now I'm definitely in! Got suddenly quiet here so I decided to post some busy work. I thought before the campaign starts, I should do a little reading up on my subjects. Matchbox looks like they are pretty spot on with accuracy. I, however did not see any rivets to count nor I did not break out the measuring calibers. On the Panzer II I might leave off the left rear storage box. Most of the photos do not show one installed back there especially the one I will be doing which is 21st Pz Div. in North Afrika. Also the rear storage box on the turret I am not sure. On the 232, the armored covers over the wheel bearings (the triangular plates) are missing. I am planning on doing the markings for the Polish campaign so I am checking if they had them during that time or were added after Poland. Nice score Stephan. Sure looks like it is going to be a great build. Robbie, nice to see you planning ahead and thinking of what you can upgrade. I'm plodding along on my M16 for the AA Group Build, but it is getting there. Pics as promised. Working on the base at the moment. Did some work on the little base it comes with. 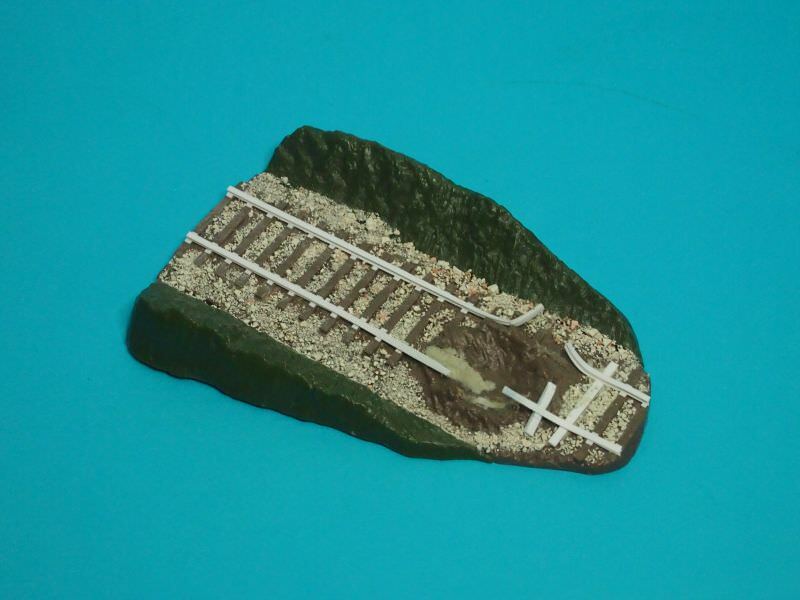 Replaced the train tracks with styrene strip rails and sleepers, added some retaining plates and then glued down some pulverised clay cat litter for the gravel (ballast) between sleepers. Glad to see a smidgeon of action here for the time being. Haven't "uncovered" anymore Matchbox goodies for the moment as have been busy trying to get things ready before winter. While I'm not an expert on German armoured cars I can relay to you what I found in the SquadronSignal book "Panzer Colors". Pictures/ilustrations from the Polish campaign show a SdKfz 232 (8 rad) without the armoured triangles BUT a 221 and a 223 with them. 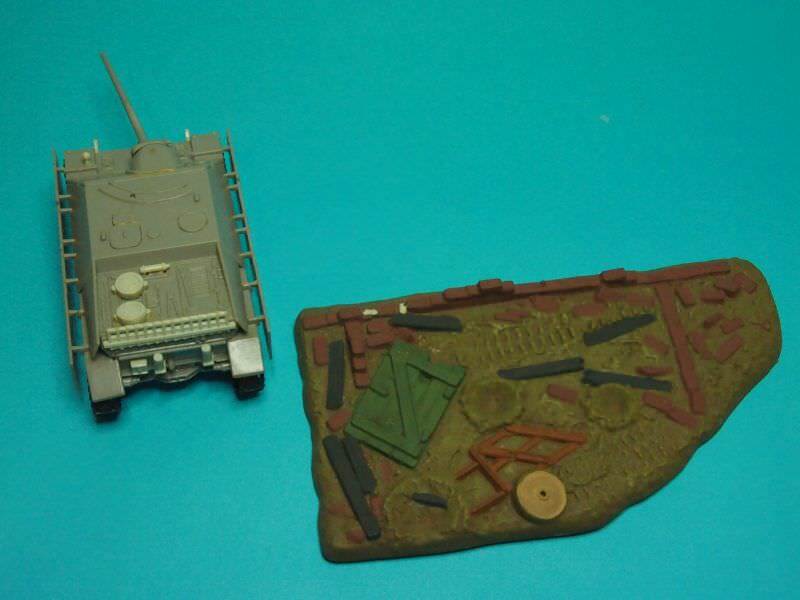 As for the Pz II turret rear storage box, it seems to be a 50/50 split with the images. Earlier photos from March '41 generally don't show boxes but later photos usually do. Hope this helps muddy things up further? As Promised Pics of my entry for the AA Group Build. Just notices I forgot to add the epoxy for the headlights - oops. 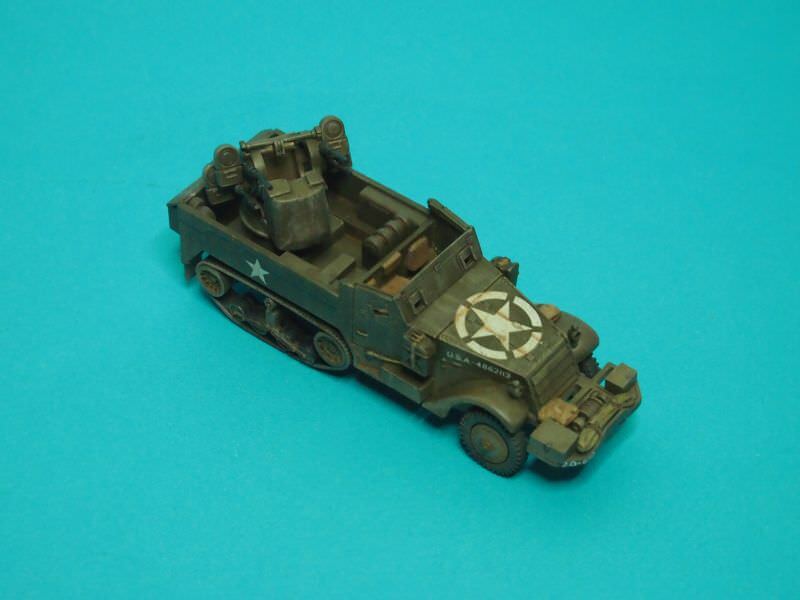 Matchbox 1/76 scale M16 Halftrack. Rear 'wall' of the Quad mount cut away and replaced with scratch built struts, braces, battery, motor, fuel tank, etc. Added scratch built stowage and tarps, gear levers, etc. Gauges are white and red decal film punched out of spare water slide decals. Looked bare without them. My idea was to enhance, not replace, so all of this is kit parts. Base was also enhanced. Hope you like it. great work on this halftrack. The extra details are really nice. I love these old matchbox kits and You have done a magnificent work. The Daimler Dingo looks promising. Great choices Oliver. I think the Humber mk II was the first Matchbox kit I ever built, so it has a special place in my heart. It was great 'Show and Tell' material at the time. Now a couple of bits missing from the base. Wonderful looking halftrack and I’m quite impressed with the work you put into the base let alone the gun mount. That Jagdpanzer of your sons’ brings back some memories and that kit seems to have been a popular subject. Could use a bit of paint now that you have some "before" images. You’ve got three interesting kits there. The Daimler Dingo is a nice fairly simple build but it is rather small. 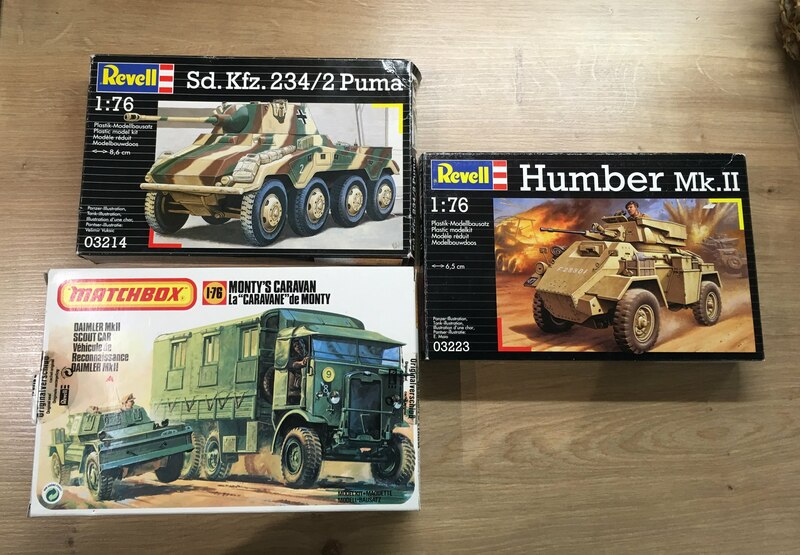 As with Pete the Humber has a soft spot in my heart also as I think it was the second Matchbox kit I built after the Panzer II. I liked it better than the old Hasegawa version, despite the slight scale difference. The Puma was fairly popular in past campaigns but be careful to get all those eight wheels touching the ground. Monty’s Caravan is quite something in that it has a nice busy base and if you are ambitious the back interior is pretty much empty except for a room divider so available to be decorated. now I can’t help but wonder if any subjects other than AFV’s and flying things will make an appearance? Yes we have had some cars and planes - are their any ships out there hiding in peoples closets? Perhaps you might inform or leave a challenge in a Model Shipwrights "General" type forum? Hmmm. Maybe on Model Geek too for those that have a Star Trek related kit lying around? Posted on both sites, so hopefully we will see some takers. It would be great to see more guys showing off their skills. FWIW, I have the Matchbox USS Indianapolis hiding in the stash. Not sure I really want to attempt it for 6 month long build. HELLO OUT THERE, ANYBODY HOME? Just thought I'd wake this thread up a bit. While going through some more boxes I discovered a Matchbox M-24 Chaffee that appears to have been on my Motor Pool Rebuild List. Here's a few images to stir those itchy fingers/minds? Obviously work got stalled and I make no apologies for the questionable quality of finishing from my youthful past. Well worth resurrecting though Jan.
Age, and dust/grime have left their residue on the poor beast but from what I vaguely recall, at the time it was made I used solely Humbrol enamels and that was most likely their version of Olive Drab and brush painted to boot. Yes, it needs tending to and I've moved it to the new modern version of my overworked Motor Pool.